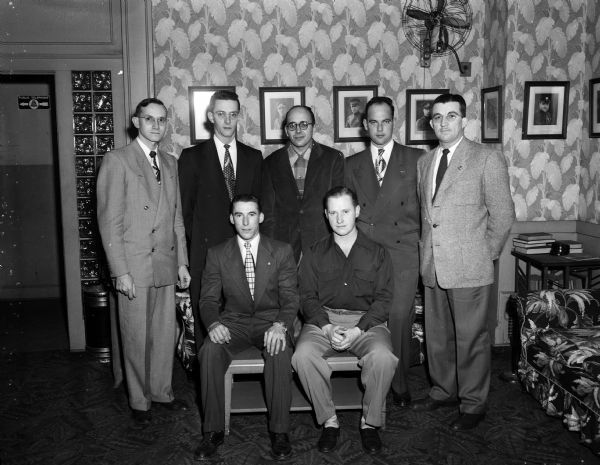 Group portrait of the newly elected officers of the Wisconsin Central Airlines Local No. 780, International Association of Machinists. Seated left to right: Darrell Brunner, vice-president, and Don Clausen, president. Standing left to right: Paul Seyer, financial secretary; Donald Brown, treasurer; Magnus Budzien, recording secretary; Walter Kneller, sentinel; and Paul Kristof, trustee. Published in the Wisconsin State Journal January 9, 1952.